Goldman Sachs updated its proprietary Bull/Bear Index, a measure of how likely a bear market is right now. The result caused plenty of doom and gloom in the headlines. The company announced the index hit its highest level since 1969. That means according to this measure, our chances of a bear market are now at multidecade highs. That was the story... But instead of taking it at face value, I dug into Goldman's index to learn more about what this reading might mean. The results might surprise you. We're nearly a decade into this bull market. That alone is enough to spook investors. It makes any evidence of a coming bear market easy to accept. But while a bear market is inevitable, it isn't necessarily imminent. That's true despite Goldman's recent report. Again, the company's Bull/Bear Index just hit the highest level we've seen since 1969. And a high level means the odds a bear market is coming are increased. Goldman looks at five indicators to uncover the chances of a market fall: stock valuations, unemployment, the ISM Manufacturing Index, the interest-rate yield curve, and inflation. Putting these five readings together, Goldman comes up with a sense for how likely a bear market is right now. And today, it says a bear market is more likely than we've seen in decades. This measure usually does signal an extreme reading before a bear market begins... but it tends to be early. Selling at the first sign of trouble is a bad idea. Most recently, we saw this happen before the financial crisis. In September 2005, Jason's indicator – which ranges from 0 to 1 – hit an extreme reading of 0.74. That was a full two years before the market's eventual peak... Stocks went on to jump another 25%-plus. The same thing happened during the tech bubble. We saw the first extreme reading in September 1999, nearly six months before the eventual top. And again, the S&P 500 Index jumped roughly 20% higher before peaking. Going further back leads to similar results. In 1964, we saw an extreme reading about a year and a half before the next bear market began. Stocks rose double digits before eventually peaking. The point isn't that this measure is useless. After all, a bear market is inevitable. It will happen. But an extreme reading from Goldman Sachs' Bull/Bear Index doesn't make it imminent. In fact, based on history, we could see gains for another year or more. That's exactly what my colleague Steve expects as the "Melt Up" plays out. So be aware that a bear market will eventually show up. But we see no need to worry until prices make a major reversal. That's not happening now. Stay long U.S. stocks. 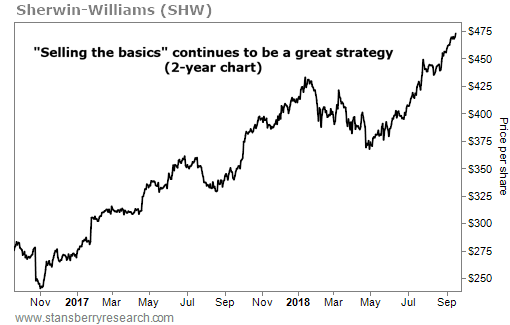 Sherwin-Williams (SHW) is a $44 billion industrial company. It specializes in making paints and coatings. The company boasts well-known brands like Valspar (paints) and Cabot (wood finishes), as well as its own Sherwin-Williams brand. And folks everywhere are using these products to brighten up their homes… In the most recent quarter, Sherwin-Williams reported record sales of nearly $4.8 billion. That’s an increase of almost 28% from the same period last year.